AH!!! 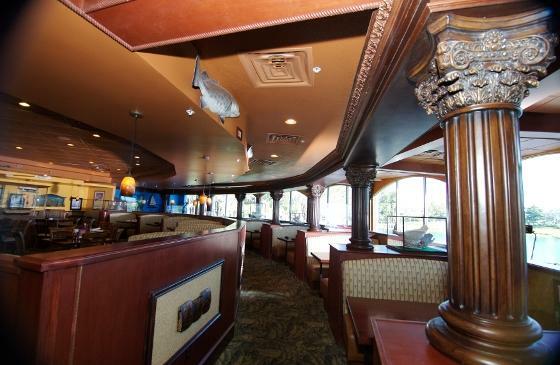 Pusser's...this is one of our favorite restaurants we have ever built. Made of all mahogany, this bar has nice arched wood panels with lion head corbels holding up architecturally ornate cornice. The Boat deck bar top made to resemble the old CrisCraft Mahogany Boats. This top is covered with an epoxy resin which provides a high gloss finish and unending protection for the wood. All the curved moulding and details were fabricated and installed by Kaylis Barcraft & Design. We also built the community tables, the arched boat ceiling with custom curved ceiling beams, to give you the feel of being inside a classic yacht. As well as the architectural head piece and booth area. The work here is quite an eye catcher.